This contest started on 1/23/19. This contest has a winner. * Win A $20 Chik-fil-A Gift Card. 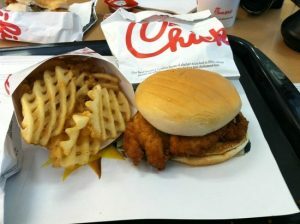 The $20 Gift Card is good at any Chik-fil-A location (chick-fil-a.com for locations, menus, prices, info). Avoid their breaded chicken products. Even though it tastes delicious, there is MSG in the breading. If that’s not an issue for you, eat up! I need to win this one. Please make me a winner. Check out their frosted lemonade … frozen custard and lemonade. Super good. Their chicken noodle soup is surprisingly good. How about all this rain today?